When I was in middle school, my band director often told the class that opening up our instrument cases would be the hardest part of practicing. Everyone knew exactly what he was talking about. It’s easy to avoid practicing the violin/clarinet/bassoon if it’s locked up inside a case. You don’t really need to play an instrument to know the feeling. Chances are, there is probably something in your life like that. For me, the hardest part of running every day is putting on my running outfit, filling up my water bottle, tying my hair up, and detaching my keys from my lanyard and keychains so they don’t weigh me down. Seriously, it takes five minutes. Likewise, when I go to work on the YA novel I’m writing, the hardest thing is opening the document, and that takes two seconds! I’m not sure why these are such gargantuan tasks in my mind, but they are a few great examples of imagined obstacles. The Zeigarnik Effect… is a construct in our minds that psychologists have observed in numerous studies on “suspense”. One such study gave participants “brain buster” puzzles to complete, but not enough time to complete them. The surprising thing was, even when participants were asked to stop, over 90% of them went on to complete the puzzles anyway. In other words, starting a project is the hardest part– but once you get started, your chances of finishing are much greater! For me, this was a really profound concept, because I realized that if I focused on sticking to a schedule (with planned breaks), I could get a lot further in my noveling efforts than if I wasted any time worrying about starting. I also realized that, for me at least, the Zeignarik Effect is mostly a visual thing. If I see something that needs to be done on a regular basis, I do it. I think this is probably the case for other people, too. My former bassoon teacher kept her $40,000 bassoon out of the case all the time, setting it on a bassoon stand. She told me she only put it away when she needed to take it to a performance. I was always nervous about how precarious that expensive bassoon looked, perched on a slender metal holder– especially because she had really large dogs that ran around, poking their noses at things on a regular basis– but I came to realize that for her, seeing her $40,000 bassoon there every single day made it a lot easier to practice regularly. Awhile back, I decided to take a leaf out of my bassoon teacher’s book and started setting partly-finished projects out where I could see them. If it was a letter I wanted to write to a friend, I would leave the writing materials on my desk. If it was a book I was half-way through reading, I would put it on the table. If it was a novel I was writing, I would put the document right on my desktop, so I wouldn’t have to open up any extra folders to get to it. For the most part, leaving out projects has helped me become a much more productive person. There are limits to how effective this is, though. When you start over-booking yourself, problems arise. Last year, I studied for three months to take my comprehensive exams in Classical Studies. I had over 700 flashcards for Greek and Latin vocabulary words I was trying to memorize, and I had thirteen texts and about twenty notebooks awaiting my attention perpetually and taking up the entire surface of my desk, plus I had all my other projects. You know how they say the way your organize your space says a lot about your place of mind? At that point, I felt like my tornado-esque room reflected my mind fairly accurately. That’s when I decided that I would only leave things out if they were on the schedule for that day. For instance, I might be studying 100 flashcards one day, so I could put the other 600 away. It made life a lot simpler. The other thing I learned about getting started and setting projects out is that it only works if you actually have firm intentions to eventually finish the projects and put them away. In other words, deadlines are great. Without them, your half-finished books or letters with languish forever on your desk. Putting your projects where you can see them obviously doesn’t guarantee you’ll complete them; you have to put in some serious effort into working on your projects with dedication, and that takes time (which I’ll talk about in another post.) But seeing them every day makes you one step closer to starting to work on them every day, and getting started is the first step. 1. I use this app that comes on Macs called “Stickies.” Basically, they’re like little post-it notes for your desktop where you can make easily-accessible lists. 2. I leave documents (like a novel or short story I’m working on) on the desktop outside of folders, so they are very accessible. 3. Before I go to sleep, I get started on the next day’s projects. For example, I write a few sentences of a blog post and save it as a draft, or I start a new chapter and write a few lines. Some authors suggest stopping mid-sentence so you have to finish it the next day. 4. At the end of each day, I always record which writing projects I worked on and I keep track of my progress. If you’re good about recording your work, you have a much more concrete means for evaluating the time you spent on writing (or any other activity) in a given month, and based off that, you can adjust your habits. 1. I don’t clutter spaces with things I know I am actually not going to work on. For instance, if I’m reading a book I don’t find very engaging, I don’t leave it out on the pretense that I’m eventually going to finish it. Instead, I just put it back and start on a new book. I try not to waste time feeling bad about it, either. It’s more productive to be truly invested in whatever activity you are doing. It will probably make you a happier person, too. 2. I don’t leave my laptop on 24/7. Sure, it makes you see your writing projects every day, but it always wastes a huge amount of energy– maybe about $219 a year. Also, leaving your laptop on 24/7 drains the battery like nobody’s business, which results in a shorter battery life. Batteries are pricey, so it’s best to just take care of the one you have. 3. I don’t believe in working on projects without taking breaks. I don’t get bucket-loads of free time, so for me, the point of my free time is to maximize the time I get to do a combination of a) things I truly enjoy doing (like reading, writing, and running) and b) the things I can work on now that my future self will thank past me for doing. One trick for maximizing that time is to plan out some breaks in your project (or some free time for your free time). Studies have shown that spending a certain amount of time every day doing relaxing things (like watching TV or checking Facebook) actually boosts productivity in the long run. 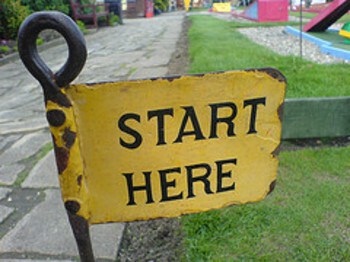 “Getting started” on a project, it turns out, is a constant project in itself. But if you don’t allow it to drift into the realm of imagined obstacles, it is a project that is easily completed. Writing, like playing bassoon, takes dedicated practice, and that dedicated practice only actually happens when you get started on your writing projects every day. I always find it easier to start whole new projects than to finish the ones I have in progress! Lord, if I followed Whedon’s advice for my first book, all I’d ever have written would be the love scenes! But luckily, I knew that was a weakness of mine, and fought it the whole way. I did plan them out lavishly in my head for weeks, though. Hahaha. That’s a great life philosophy! I think it’s definitely easier to work on something you want to work on first. And I completely relate to having difficulty finishing projects. I really admire people who can juggle a lot of projects very expertly. I read once that Isaac Asimov always worked on at least 5 books at once. MY GOD. I wish I knew his secret. He almost seemed to consider it a compulsion–I read a short story of his today, something about Dreams (I’m too lazy to get up and check the actual book), in which it sounded like he was saying that he almost felt like writers were enslaved by their own outpouring of constant inspiration. Isn’t he the one who said “write faster!” when someone asked what he’d do if he had six months to live? I am, incidentally, a bit platonically (or something) in love with him through his nonfiction writing personality. I accidentally named the beefy wizard hunk in my novel after him. It wasn’t on purpose, but the alacrity with which I accepted the idea–I’m chalking that one up to subconscious. I really want to read more about his life now– I’m sure I could learn a lot from him. That’s awesome. Sounds like you have really high expectations for yourself and a lot of your readers have high expectations for you, too, and that’s awesome! 🙂 Plus, whatever gets you to write must be some kind of positive, right? I can totally see how those expectations would get intimidating, though! A positive? totally – I live and breathe to write. I love seeing those inner creations take form in the written word and I adore that readers love it, too, and want more. I do have high expectations, but that rather snuck up on me. All my fears and insecurities happened before I published and before I tested myself against real readers out there. I know what I can produce now, I know the quality of my writing, although I’ve always been a bit of a perfectionist when it comes to my own work. That’s one of the reasons I research so heavily, I have a real need to “get it right”. You are so inspiring 🙂 That’s an awesome way of looking at it. 😀 Thank you, and I’m sure you do too! I really like your “style” lady! Your blog is fresh and informative. It is also very entertaining. Good work! Ah yes, thank you for visiting my place as well.